*  along with this program. If not, see . // Make ready the RTOS! Its probably safe to assume that most of you who end of reading this have heard about the Arduino. For those of you who haven’t heard of it, they are the latest microcontroller craze and they are selling by the tens of thousands. Basically its a development board for a few lucky Atmel AVRs and it has a standard expansion connector set to adapt with numerous peripheral boards. Personally, I’m not too much of a fan of them, for most of my projects I don’t need a board with a boot loader. I own an AVR ISP mk.ii programmer and I don’t need to spend $35+ on a board with a $2 ATmega328 when I can by an ATmega644 or a larger chip for $4 and build my own dev board for another few dollars or so. Although, I do understand that they are nice for prototyping and what I’m doing is more of an end-product type thing. The robot I built with my friends from the UC Merced Robotics Society for Robomagellan in the spring 2012 semester used a pair of Arduinos and I wanted to use the code I developed there with my pre-existing software framework for the AVRs. Since I don’t have any arduinos hanging around, I needed to either port the code or just make my own arduino. My favorite AVR is the Atmega644, it has a ton of I/O and the most flash of any DIP variant AVR. I came across this web page on using a chip from the most popular of the arduinos in its bare chip form to run a christmas frame. It goes over how to add a definition to the arduino IDE hardware list. As I was reading through it, I noticed a few places where I could set different MCUs, frequencies, etc. So I decided to try it out. 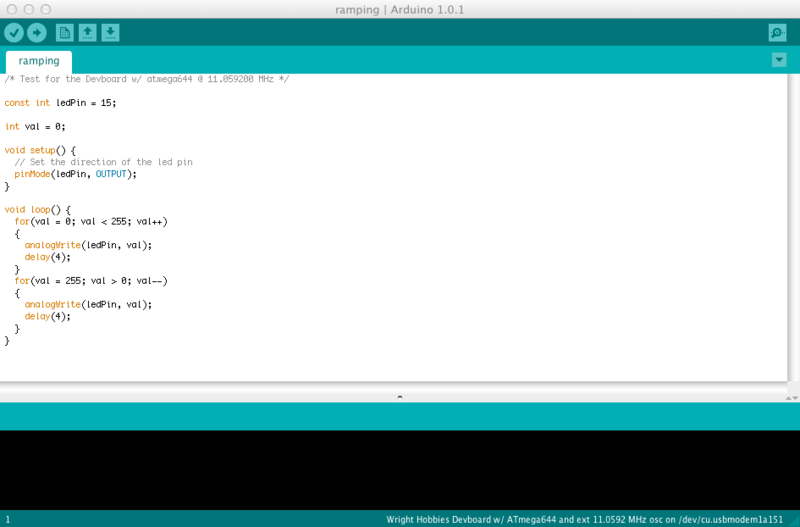 The arduino ide manages different devices in what they seem to call variants. Each variant is a definition of the chip that you are using. It defines how pins map to internal components of the AVR. The first step is defining how many analog and digital pins exists on the device. 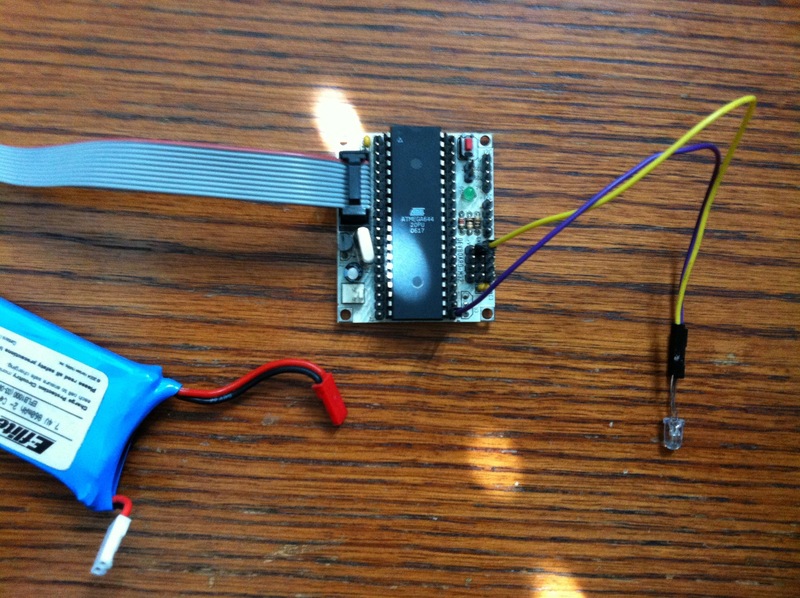 The rest of the file is mapping arduino digital pin numbers to registers in the device. It also covers how these pins translate to their corresponding PCINT pins and which pins have PWM capabilities and what timer drives it. You can get this in my github repository. The last step is to add an entry for the board you are using. The board I used is rather old. It was designed by Wrighthobbies about 7 years ago. It was literally not much more than a board that broke out the pins of an ATmega32 and provided a stk200 compatible programming header, a reset button, two 5V regulators, an optional oscillator, and some power rails. The ATmega644 and its variants are pin for pin compatible with the ATmega32, so I just replaced the chips. Although, you can add a comment to your order at Wrighthobbies and Eddy will just ship an ATmega644 with it. <board name>.name – provides the textual name of your board that you are presented in the Arduino IDE.